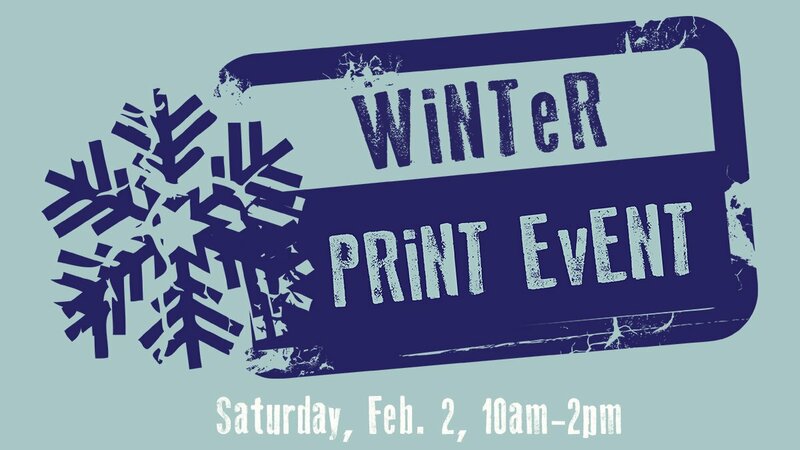 All ages are invited to participate in the festivities of the first annual Winter Print Event at Peninsula School of Art (PenArt), 3900 County Road F, on Saturday, February 2, from 10am-2pm. The event is being held In conjunction with Fish Creek’s Winter Fest and in partnership with Peninsula Preschool. For the first time ever, PenArt is hosting a family-friendly, hands-on art making event during Fish Creek’s Winterfest. Participants can choose from one (or all three activities), including screen printing a commemorative t-shirt, block printing a tote bag, or hand-coloring a limited edition poster. According to PenArt’s Executive Director, Catherine Hoke, “After 12 years of hosting the SOUP! event on Winterfest weekend, we felt it was time to do something different. We wanted to create a new event that encouraged participants of all ages to get in the studio and have an art experience.” Working with local artists, two commemorative designs have been created that will be printed on posters. These posters can be hand-colored, creating a unique and memorable piece of art. The designs will also be available for participants to screen print onto a t-shirt. “It’s a great way to see what the printmaking process is all about, and take home something special to celebrate winter in Fish Creek,” said Hoke. Of course there will still be food. PenArt has partnered with the non-profit, Peninsula Preschool, which will be serving up mac ‘n cheese, brats, sides and beverages in the Guenzel Gallery after all the art making fun. Participants may drop in anytime and no preregistration is needed. The cost to participate is $5 for lunch, $10 for t-shirts, $5 for a totebag and poster, or $2 for a poster. All proceeds from the event benefit the education programs of Peninsula School of Art and Peninsula Preschool.